Welcome to the Digistump wiki - we plan to grow this wiki to contain not only documentation for the Digispark and other Digistump products, but to also showcase projects, users, applications, and more! The Wiki is now open for collaborative editing! Please feel free to edit any page to make corrections or add valuable information - please DO NOT remove information or replace the tutorials we have provided. Feel free to write an alternative tutorial for anything (and of course feel free to add new tutorials, projects, etc. and link them in the appropriate list on this page) and link them from this index. If your version is better we may replace the original. Since this is the first resource for many beginners we want to make sure any changes are accurate and contain the information they need. Please excuse the dust, the occasional incomplete tutorial, and the currently small number of code samples. Please help us improve all of these things! We'll be rewarding those who do with free products, discounts, etc. - we hope this information will get you started with the Digispark system! First steps: Connecting your Digispark - Arduino IDE, Drivers, etc. 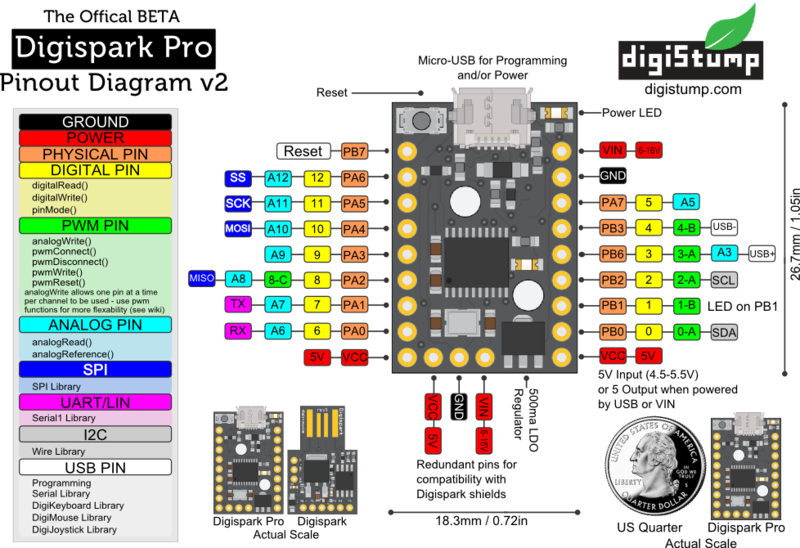 First steps: Connecting your Digispark Pro - Arduino IDE, Drivers, etc. Note: Digistump does not and will not provide support for third party boards, though you are welcome to ask in the forums. Remember Digistump purchases support development of the Digispark IDE, tutorials, etc that these derivatives freely use - no royalties are paid to Digistump by these companies.